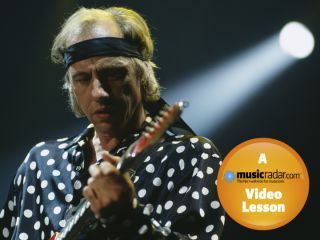 In this video lesson, we show you how to play like Dire Straits guitar man Mark Knopfler. Mark Knopfler, an early influence on Children Of Bodom frontman Alexi Laiho, is renowned for his unconventional picking style, favouring a fingerpicked approach for his solos and rhythm. To recreate the Dire Straits guitarist's signature sound, we've recorded all of our examples using this fingerpicked approach, though a hybrid-picked (pick and fingers) approach would work well too. For Examples 1 and 2, use the combined bridge and middle pickups on a Strat (or similar style guitar) with a touch of overdrive. These examples are styled after Mark's early Dire Straits era when he'd rarely be seen playing anything other than a Fender Stratocaster. Example 3 combines riffing and melody and looks to the mid 80s when Mark used a distorted Gibson Les Paul and later still, his Pensa MK guitar series. In this example, add a bit more drive and squash the sound with a wah pedal fixed around halfway through its travel. This hybrid of rhythm and lead playing is an essential part of Mark's playing style. Using chord shapes spread over three strings, it's possible to fill out the sound with chord playing and then embellish these rhythm ideas with lead phrases using nearby notes on the neck. 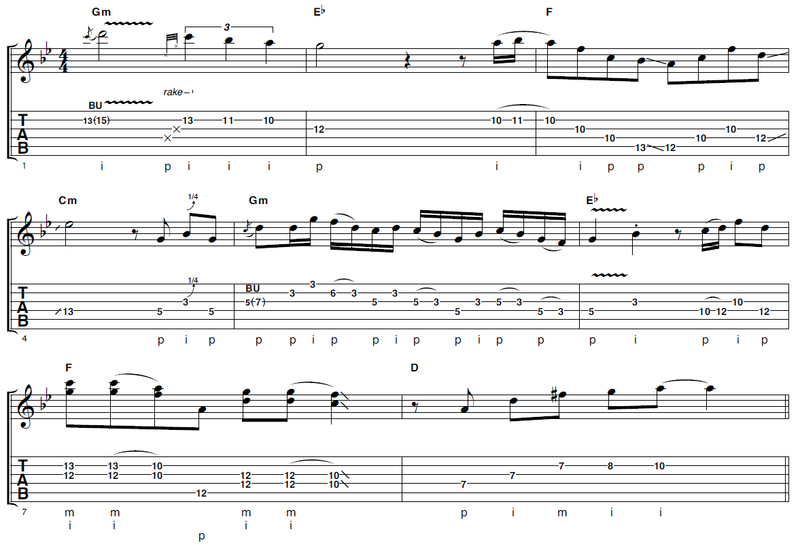 For the full on Knopfler effect, put your pick down and fingerpick this example instead. It's based on the G natural minor scale, although a few chord tones are targeted too, like the change to D major at the end. Follow the picking instructions carefully in bar 5 - Mark's thumb always features heavily in this kind of lick. This example is representative of Mark's mid-80s era when he favoured Les Pauls and his Pensa MK series guitar, and it showcases his fondness for combining riffs and melody. Use the bridge pickup, more drive and a wah pedal in a fixed position for this example.